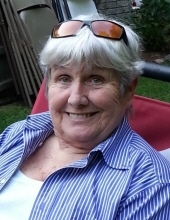 SALLY EBERLE of Rochester, MI, passed away February 6, 2019, age 73. She is remembered and missed by her loving partner, Bill Hall and her 3 children: Carrie Reinis (Brad), Marcie Cornett (Dave), and Michael Eberle. The prides of her heart were her grandchildren, Rachael (Jim), Ryan, and Michael Werkman, Taylor, Madison, and Jordan Cornett, and great grandchildren Kendall & Zoey Keary, Oliver Beauchamp, and Kylie Werkman. Sally also leaves behind her sisters Patricia Heisler and Marcie Miller and a lifetime of cherished friends and family. Most important in her life was her faith in God and her love for her family. After that, she loved to travel, was a lifetime Girl Scout and adored spoiling children. We know that she is overjoyed to be in Heaven where she can sit and chat for hours with Jesus, Julie, Ed, Ric, and all the others that welcomed her when she arrived. We will miss you Mom, but are comforted to know that you have an even “better seat” to watch over us as you always have. "Email Address" would like to share the life celebration of Sally Diane Eberle. Click on the "link" to go to share a favorite memory or leave a condolence message for the family.